I never had braces. I was one of those “blessed” children that lost their baby teeth normally, and had their adult teeth come in straight. Sure I went through an ugly duckling phase where I had some serious gaps, but otherwise I thought I’d hit the genetic tooth lottery. At about 22, I realized that those previously straight teeth really weren’t that straight anymore. I even went so far as to ask my dental hygienist about the possibility of getting a retainer to keep my teeth from moving anymore. I think she thought I was a little nuts, but she offered a referral to an Orthodontist if I really wanted one. I decided not to pursue it, thinking there is no way I wanted to be consulted and be sold a mouth of metal. That’s where I was wrong though. I didn’t have to have metal braces to get straighter teeth. 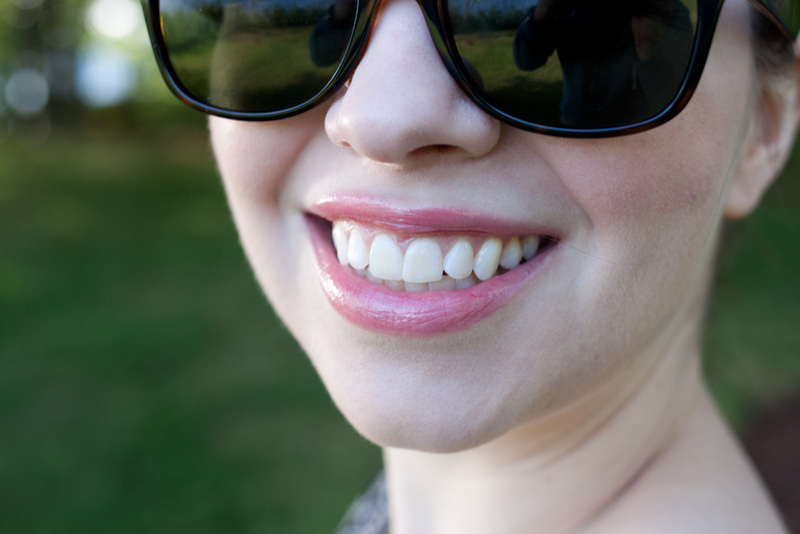 Invisalign can treat minor cosmetic issues like mine, as well as more serious orthodontic issues. Invisalign and Invisalign Teen can treat a variety of conditions like underbites (like Rigby’s) or overbites, overly crowded or even widely spaced teeth. Invisalign’s technology keeps getting better and better, and can treat many more orthodontic issues than it used to. For more information about Invisalign options, visit the Invisalign website or find a doctor near you. Three years later, my teeth are more crooked then they were at 22. I look at pictures and see my teeth overlapping. It’s really silly. I mean, it is a cosmetic problem, and almost all of the time, I like my teeth. But every once in awhile, when the light hits just so, they look crooked in photos and I feel less than stellar about that. Maybe one day I’ll make that orthodontist appointment, but for now I’m content. Have you ever had braces? If you haven’t, would you ever consider a treatment like Invisalign? This post was sponsored by Invisalign. As always, all thoughts and opinions are my own. Ugh, I know how you feel! I had braces but my teeth are shifting a little bit… my mom likes to point it out all the time and it makes me feel awkward! haha. Dude, I HAD metal braces and my teeth all shifted around when I got older. It’s really just a cosmetic problem but I would still like to fix it. Too bad orthodontics ain’t cheap! Seriously, plus the hassle of the whole thing! It’s really too bad that age continues to wreak havoc on our teeth. oh gosh what i would do to win this! no chance though, boo. i have never had good teeth and would do invsalign in a heartbeat if i could afford it. :( Well here’s to hoping you win it anyways. I know Invisalign is much more affordable then people think (same cost as metal braces), but orthodontics in general are not inexpensive. I just finished my Invisalign treatment! It was totally worth it. I had metal braces as a teenager, but my teeth shifted back as an adult, and they drove me crazy. Plus, it’s easier to keep straight teeth clean, so it’s also a hygiene thing. Now I wear my Invisaligns only at night, and I will for the rest of my life if I want to keep my teeth straight. It’s a really good system, in my opinion. I’m glad to hear it worked for you – that’s awesome! I think if my teeth continue to shift I will look into it and schedule an appointment with an orthodontist. I had braces for years and I still consider Invisalign from time to time! Then I usually remember how much I hated my retainers and orthodontist visits and decide I don’t want to save up for that hell again. ;) but seriously, if I had a cash windfall I think I’d do this before LASIK. Ah, yes, I’d love to get LASIK one day too. My eyes are still changing though each year when I go in so I’m probably not even a good candidate for that, and I’m sure its also insanely expensive. Sad to hear invisalign didn’t work out for you. When I took invisalign treatment from Edmonton, Canada last year, I had my doubts about its effectiveness. Especially after my dentist made a remark that effectiveness can vary with individuals. But the result was much better than I expected. The important thing is to consult a good dentist before making a final decision on which way to go. An expert dentist can check with the condition of the teeth and identify the treatment that works better. I actually haven’t tried it yet, as I never had braces as a teenager, but instead noticed movement in my early 20s. I’ve thought about it, but at this time I don’t think it’s necessary for me. I’m thinking of having a retainer made to prevent more shifting of my teeth though. Glad to hear you looking at different varieties of answer for yourself, braces really aren’t what they were now they can be so much smaller and less painful. They really can be effective, even on older more grown up teeth :) Best of luck, hope you find a method that suits you. It’s true that braces are better than they used to be, but Invisalign is definitely where it’s at if you can afford it! Yes, I agree with you Invisalign is the best solution for crooked tooth and it will help you to straighten your teeth, make your smile more attractive one. Invisalign is the best option for straightening the crooked tooth. it more easy and convenient then metal braces.